What did the first quasars look like? The nearest quasars are now known to be supermassive black holes in the centers of galaxies. Gas and dust that falls toward a quasar glows brightly, sometimes outglowing the entire home galaxy. 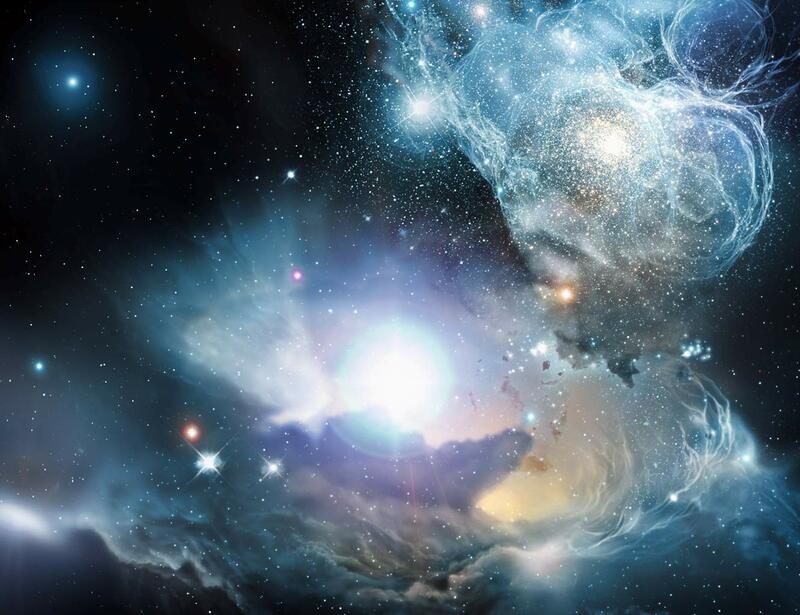 The quasars that formed in the first billion years of the universe are more mysterious, though, with even the nature of the surrounding gas still unknown. Above, an artist's impression shows a primordial quasar as it might have been, surrounded by sheets of gas, dust, stars, and early star clusters. Exacting observations of three distant quasars now indicate emission of very specific colors of the element iron. These Hubble Space Telescope observations, which bolster recent results from the WMAP mission, indicate that a whole complete cycle of stars was born, created this iron, and died within the first few hundred million years of the universe.